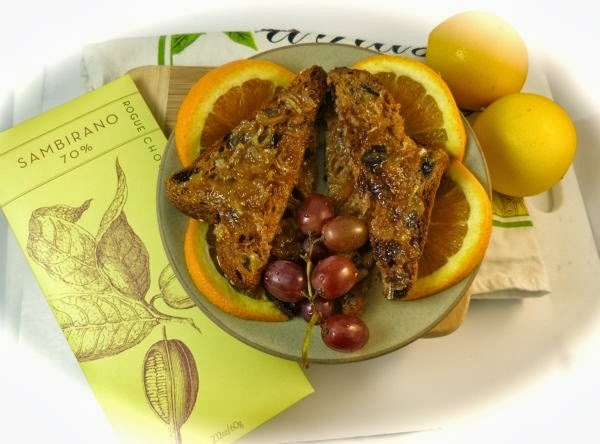 What does this lovely Sambirano* 70% single origin bar from Rogue Chocolatier (Three Rivers, MA) have to do with lemons? The answer has to do with experimenting with flavor pairings. Much like there are color groupings that will work better in a given context than others -- one can pair chocolate with items that mirror, complement or oppose certain characteristics of a bar. Sometimes the pairings result in delightful surprises and sometimes the results are oddly unpredictable. 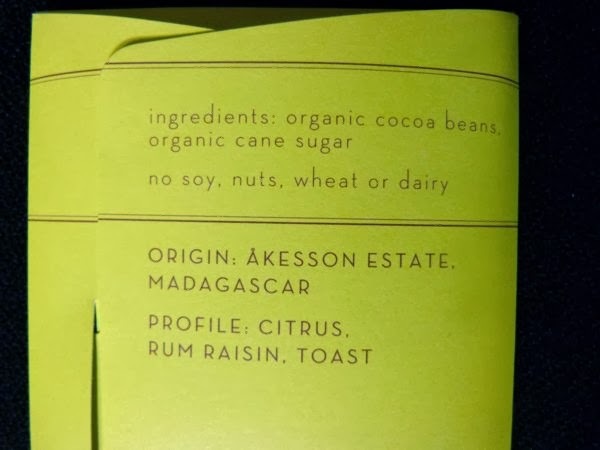 The profile (tasting notes) printed on this bar's packaging stated: "citrus, rum raisin, toast." 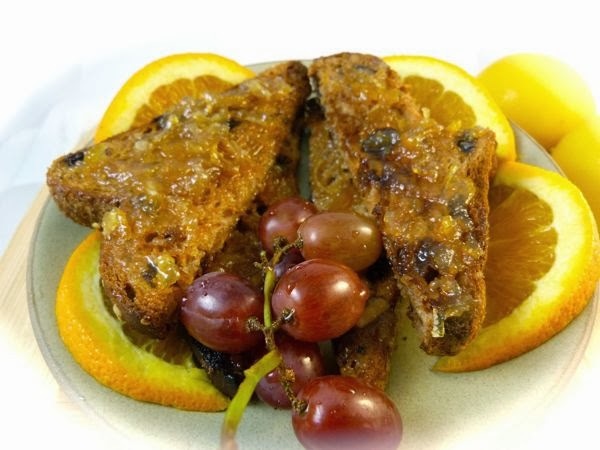 I mimicked the tasting notes, by pairing this bar with slices of (gluten-free) raisin toast, drizzled with Meyer lemon infused olive oil; Myers's dark rum, and Meyer lemon jam. I enjoyed the pairing; however, with a bar this good, I also made sure to savor bites of chocolate before, during and after the toast plate items. This artfully complex bar did indeed have very pleasing, well-balanced citrus and raisin notes. *This 70% Sambirano bar was made with cacao beans from the Akesson Estate, in Madagascar. The most recent batch (bar) may have slightly different tasting notes. Much like a wine, batches differ from year to year. 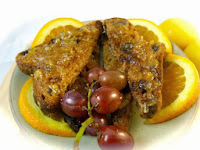 An inspired snack that I would love to try!